We’d spent some time chatting to Sam and Taryn before they headed off and made plans to see them again in Sydney before they were leaving for their great adventure in the Americas. We’d long made up our mind that we’d return to Sydney for a little longer. We love the city and it felt like we weren’t done with it yet. This time we would take the scenic route. A guy I met in a cafe back in Sydney weeks ago had spotted my bike and we’d got chatting. Turns out he’s a keen biker and knows the area well. 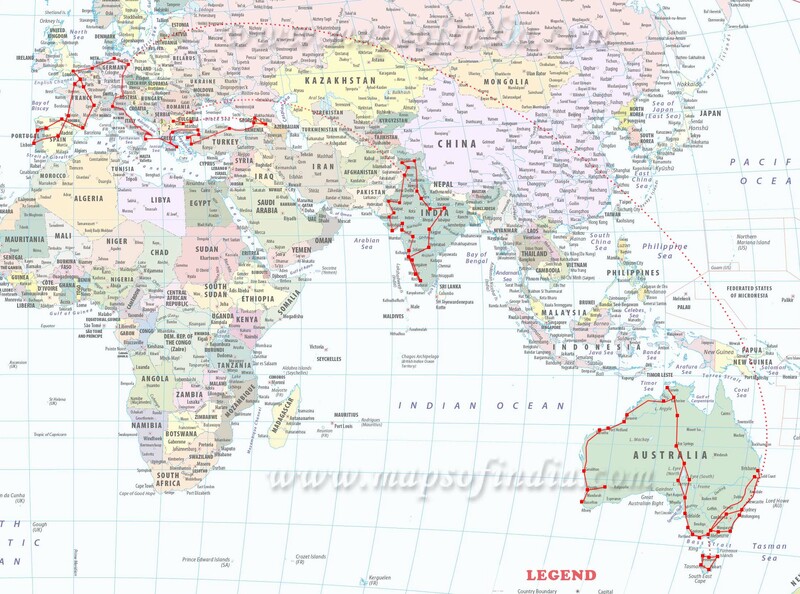 So he’d written all the awesome roads between Sydney and Melbourne on a sticky note for me. We’d had to give the borrowed stove back to the Touratech guy and today was Sunday. So no camping stores open anywhere. We just stocked up on rabbit food (read “salad”) and wine in Alexandria and then headed for the hills. The awesome landscape turned to dry foresty mountains and our bikes were swimming up the gravely twisties of a fire truck road. Aidan wanted to camp up here but I have a strange and sporadic aversion to pine trees so I suggested we camp down by the lake the map was promising us. We rode back down the mountain with views of a bright blue lake teasing us through gaps in the trees. Disappointingly rich people’s houses lined the lake shores. And when we finally found an access point we were greeted by a sign forbidding the two things we wanted to do most: “No Camping” and “No Motorcycling”. What?! The spot wasn’t exactly hidden so secretly pitching the tent there anyways wasn’t an option. We rode on and were greeted by lots and lots of kangaroos grazing away in the evening sun. We followed the road along the lake side but the no camping signs were everywhere. It was getting late and we really needed a spot to sleep. Aidan took us onto the main road, then off the other side, along some cycle path and straight into the Black Swamp. He gunned it straight in. But luckily he didn’t sink. He’d seen some tracks and had a suspicion that another biker had made this place home for the previous night. Well, it would do nicely! So we pitched the tent, munched our super healthy greens and tucked into the wine. The next morning Aidan dropped Pippa on the way out of the tall grass. Of course he didn’t wait around for me to take a photo (despite everything Grant had said in his photography class). We found a camping stove in town and I even managed to get a cheap little hammer in the hardware store to replace the one had tragically died trying to get the tent peg out of the tree root in Marysville. We left without getting petrol as Aidan thought there was a petrol station ahead. Of course we weren’t where he thought we were and Lea chugged to a halt pretty soon. (Lea only has a 200km tank range and needs refueling much more often than Pippa.) We couldn’t get the siphon to work so Aidan headed back into town to fill our little fuel stove bottle – it would give me enough to make it to the petrol station myself. When we got back to the petrol station a rider pulled up on an old Moto Guzzi! His thing is to ride bikes off road and in places that they are not really made for. He loves going to Europe and each time he comes back with lots of old Guzzis from Italy. He has a garage full of them. He knew of the HU meeting but regrettably couldn’t make it this year because he’d been on some local rally through dust and mud instead. Of course we swapped travel routes and bodger fix tips (such as using velcro straps from Officeworks instead of zip ties so you don’t have to cut them each time you need to get to your cables). Eventually our new friend remembered that he should probably pay for his petrol and we set off again. We soon passed a dam and then found ourselves on the stunning Murray River Road. We stopped all over the place to take photos and watch the pelicans swooping over to lunge into the water. Of course there still were no camping signs everywhere but we soon found a little side track on a hill with an excellent view over the valley, even if it was through an electric fence. It was still nice n early so Aidan set about cooking dinner on our new stove. Which was quite a stressful affair! Millions of flies appeared out of nowhere. And they are not as stupid as European flies that sort of go away if you swat them off. Australian flies are super persistent and just move an inch along if you slap at them. We ate our dinner walking around try and evade them. With limited success. Aidan fled into the tent after that to write his diary but Skunk and I braved the flies to take in the awesome view. At sunset Aidan came out again to take some photos and make use of the tips we’d learned from Grant at the HU meeting. The next morning we woke to a fresh landscape and pelicans frolicking in the sun. The river became smaller and smaller and gave way to farmland and the famous Murray Grey cows. They even have a little monument in their honour, depicting their history. Suddenly my bike went “dadunk!” and released a strong smell of ‘ocean breeze’. 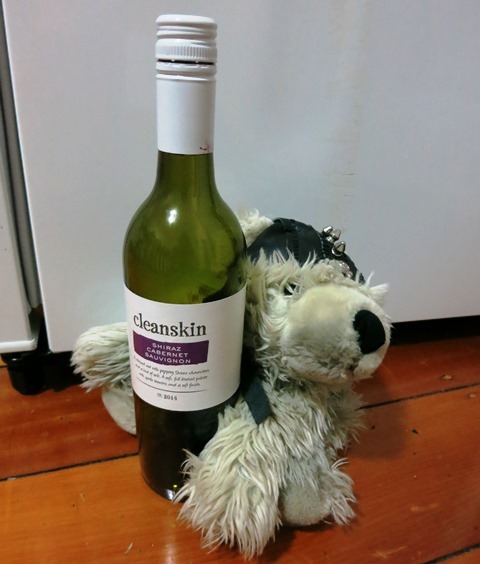 I had run over our bottle of leftover laundry liquid from Sydney! It had rattled lose and fallen off Aidan’s pannier. We soon realised that he’d lost our little fuel stove bottle too so he rode back to fetch it. He found it and we filled it up at a tiny petrol station-cafe-village shop in the next town along with our tanks of course. It might come in handy if Lea runs out before we find another petrol station…. A few kilometres on I saw a white plastic bag flapping from Aidan’s pannier. When he’d let me catch him up, we discovered the fuel bottle had disappeared again. Aidan was pissed off because this time he’d tied it on extra tight! We spent hours riding back and forth to the petrol station, scanning the side of the road for our little red bottle. But we couldn’t find it! Oh well, the pressure bit that makes it work with the stove was broken anyways… We just hoped that someone had found it and picked it up, since it was now full of flammable fuel! Then Skunk got stung by a Bee-thingy. Not going well! We stopped for lunch at a little view point. The sign on the side informed us that the mountains in the distance are the Australian Alps, Australia’s highest mountains. And the Murray River was actually this continent’s longest river! Eventually the river disappeared from view and we found ourselves in the foothills of the alps. A little village had a sign at the exit that there wouldn’t be a petrol station for the next two hours. How many kilometers that would be surely depends on your driving style and the road conditions! But I spun around to fill up Lea’s tank just in case. It also gave Aidan a chance to check his Navi. We’d missed the turn of the intended road and were instead on the road that Grant had recommended. He’d been raving about the awesome twisties with a telling glint in his eye so of course we carried on. And he hadn’t been wrong. The ride was amazing fun! Challenging uphill twisties through forest with no scenery to distract from the riding joy. We reached another view point with a glimpse of the peaks of the Alps. It wasn’t that amazing though. I bet it’s stunning in winter in the snow! The landscape changed and the twisties eased up into sweeping bends. We were quite high up now and the trees were bare and sliver with rugged green brush nestled at their feet. It had quite a surreal and fairy tale like feel. And it was cold up here in our summer gear. The mountain tips at the top of the ski resort even had a little snow left on them. Soon the cold started creeping into our bones and we couldn’t wait to come back down off the mountain. We didn’t have far to go. The landscape opened up and the road slowly descended onto a plateau. We found a supermarket in a larger town and stocked up for dinner. The sun was getting lower and cold evening mists were rising from the lake below town. We circled the lake and foud some gravel roads on the hill behind leading to a grassy, brush-speckled field with stunning views of the lake. The people returning to the houses dotted around a few hundred metres off didn’t even seem to notice us. Aidan and Skunk cheffed up as the sun was setting and we found a little cove to shelter us from the cold wind that had picked up. After dinner Aidan set up the camera to take long exposure shots of the clear starry sky. But he soon gave up, chased into the tent by the frosty wind. In the morning Aidan left the tent to go for a pee to find a bunch of roos grazing next to the tent. But he missed the photo opportunity in spite of all intentions. It was literally too freezing cold outside and his toasty sleeping bag won over the camera. When I woke up there was still frost on the grass and the bikes. Spring hadn’t quite sprung up here yet. By the time we set off the sun had thawed everything out and the road continued to slowly climb downwards. We found a brass model of the mountains we’d just ridden around in a nearby town and got a birds eye view of how it all fits together. As we were leaving a sign warned “No petrol for 161km”. Just as well we’d filled Lea up then. Farmland turned to forest and the road to gravel. The guy at the cafe in Sydney had asked me if I liked gravel and as Lea was rattling and swimming along I almost regretted saying yes. Almost! I slowed right down and began to learn how this little bike handles in gravel. And soon I was having loads of fun! Even if it meant Aidan had to wait for me loads. But then he also missed the cute little echidna that I spotted scurrying off into the trees. We came past colourful lines of post boxes of all shapes and sizes. The houses here are so far apart, the post boxes are placed along the main postie route and people have to drive to them to fetch their mail. The local road works lollipop men are sporting proper cowboy hats here… a little taster of what awaits in the outback? After stocking up in another town the road climbed steeply up a rocky mountain and then just as suddenly dropped back down depositing us in a grassy valley where every piece of land was either too steep for camping or occupied and fenced in. In the end we followed a residential road until the tarmac ended and potholed mud and grass continued into the fields with a sign announcing “The road is not maintained by NSW council beyond this point!” in true Australian ‘we’re-not-responsible-so-don’t-try-to-sue-us” style. It also forbid us to ride on but the two locals returning from tending to the cows didn’t seem to mind. At the end of track was a wide open gate to an unused field with white flowers taller than Aidan. Perfect! On Seven I wouldn’t have dared but on Lea I confidently gunned it down the damp grassy decline. And promptly bottomed out on a muddy hill both wheels spinning freely in the air. I’d just called Aidan for help when a lot of rocking backwards provided traction for the rear wheel and had me spinning sideways to freedom. All without dropping my bike! I was well chuffed with that! The next morning our tent was surrounded by thick grey cloud. The sun made an enormous effort to dissipate it and finally broke through as we were loaded up and ready to set off. But Lea refused to start! She wouldn’t even turn over the starter motor! Kill switch? Nope. Main Fuse then! We rode into Kangaroo valley and something our Sydney house mate Kate had said had us looking for a fridge randomly standing around in the middle of nowhere. But no matter how much we were craning our necks and swiveling our heads around, the fridge was nowhere to be found. It was supposed to be full of fudge. You drop some money into the box by the side and help yourself. Maybe the honour-payment system hadn’t worked out… shame! A fun, steep and twisty road took us back out of the valley and the landscape was pretty flat from now on. Our laptop blew the fuse as I plugged it in. But luckily I happened to find the fuse box before the staff were any the wiser. So we enjoyed some fancy coffee and dragged out lunch as our devices were charging and we got back in touch with the real world. A couple of people stopped to chat, having spotted our bikes and probably smelled the adventure on us – we hadn’t had a shower since Marysville. Eventually it was time to set off. We stopped in Wollongong to stock up on food for the night and planned to find camp early to catch up with our diaries before we got back to city life the next day. But of course it didn’t work out that way. As soon as we left the residential area behind a pretty national park stretches all along the coast. You can only camp in it with a permit, which we didn’t have. And there were plenty of rangers driving around so we were bound to get caught. We were long beyond the point of return when we realised that this was the nature reserve that stretches all the way to Sydney! We followed the sign that advertised camping. Turns out you need to pay in advance or book via the phone. But the number advertised by the entrance was “not connected”. A new plan had us head west to try and escape the reserve and find a field or so. But no luck! It was all residential for miles and we were zig-zagging up and down streets only to find more houses and manicured lawns. By now the sun was setting and we gave up trying to find a free corner to camp in. I called the hostel but they had no free bed tonight. Without internet we couldn’t find another that would have parking. Aidan started searching the Navi for nearby hotels. Frustrated and disappointed we were resigned to the fact that we’d probably have to fork out a fortune for a crappy hotel we really didn’t want to be in. Then we had the bright idea to call our friends in Sydney who’d taken us in once before when we first landed and they came to our rescue. They would be out but there was a spare key and we were welcome to make ourselves at home. Awesome! Thanks so much guys!